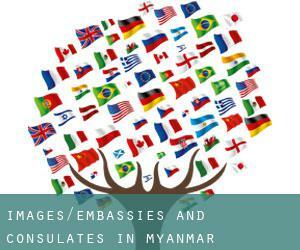 Check out the list of Consulates in Myanmar and around we've collected for you. If we were unable to locate any of all Consulates in Myanmar will show you the closest ones. Diplomatic missions open and close consulates from time to time based on the demand of citizens in each region, so the list of Embassies and Consulates in Myanmar that we're showing you below might change. The premises of the embassy or diplomatic mission are kind of sacred. The host country authorities may not enter the premises without the consent of the head from the Embassy. The territory occupied by the Embassy is own by the represented country. Its mission is to promote the interests of his country in the host nation, promoting friendly relations in between the two countries, promote economic, cultural, scientific, etc, making state visits, both commercial and political treaties, among numerous other functions. Review the content of this page to get the address, phone and make contact with details of all the Embassies and Consulates in Myanmar and nearby cities. The Consul is the person who heads the Consulate. In some cases functions as a delegation from the Embassy, where they collect the steps which might be taken to the Embassy, as well as other necessities. Access to this section for a detailed listing of all Chinese consulates, embassies and representative offices located near Myanmar. ConsulBy offers all Indian citizens with an updated and verified list of all Indian consular offices so they can get in touch with them with any unexpected scenario while in Myanmar and its surroundings. Have a look using this link a collection of all US embassies and consular offices placed around Myanmar, just in case you'll need assistance though you're abroad. Check the Nigerian diplomatic mission in Myanmar, responsible for offering assistance and support to any Nigerian person though they are visiting the country. Access to this section for a detailed listing of all Russian consulates, embassies and representative offices located near Myanmar. ConsulBy provides all German citizens with an updated and verified list of all German consular offices so they could get in touch with them with any unexpected situation while in Myanmar and its surroundings. Have a look employing this link a collection of all French embassies and consular offices placed around Myanmar, just in case you'll need assistance while you're abroad. Check the British diplomatic mission in Myanmar, responsible for providing assistance and support to any British person even though they are visiting the country. Problems with Myanmar authorities? Get in touch with straight away with any of the diplomatic missions borwsed for Bago to find the best solution using the local authorities. Diplomatic missions are usually in populations with greater number of inhabitants. With 4.477.638 residents Myanmar is one of the most influential centers of population Myanmar. One on the busiest centers of population Myanmar is, without any doubt Mandalay with 1.208.099 inhabitants, producing it a good candidate to host one or even more Consular Mission in Mandalay. We have classified all embassies by nearest town. Given that Mawlamyine is one of the six largest cities of Myanmar, with around 438.861 inhabitants, it's likely that hosts a few consulates. Diplomatic missions are usually in populations with greater number of inhabitants. With 182.011 residents Myanmar is one of the most influential centers of population Myanmar. It is almost impossible to visit Myanmar bypassing Pathein (with 237.089 inhabitants). ConsulBy presently has an extensive catalog of Consulate in Pathein and surroundings. The embassies and consulates located in Myanmar and exist to help their compatriots to solve any problem as if they were back home. Adhere to the link to determine all Consular Mission in Nay Pyi Taw and its surroundings. One of the busiest centers of population Myanmar is, without any doubt Akyab with 177.743 inhabitants, producing it a good candidate to host one or more Consular Mission in Akyab.